Sorry folks, we have to cancel tonight… the band can’t here here easily… and neither can a lot of you. We’ll try and make it happen again another time. Armed with a stage full of guitars, Pete Oxley and Nick Meier return to The Bear Club (following two previous sell-out gigs) as a quartet with Raph Mizraki on bass and Paul Caviacuti on drums. Expect a dazzling display of contemporary fare, ranging from Turkish panache to soundscapes of latin America to English pastoralism. Hear this played on nylon string, steel string, electric and acoustic 12 strings, fretless, slide, guitar-synth, glissentar guitars and more! Chris Corcoran is one of the UK's finest Blues guitarists. 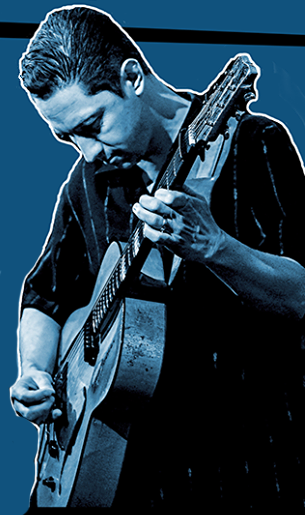 His latest CD 'Blues Guitar Grooves' was awarded 'Best Instrumental Album' by US Blues Magazine 'Blues Junction'. He has recently been asked by 'Guitarist Magazine' to produce a series of Jump Blues columns. With the expert pairing of Matt Radford (Bass) and Peter Greatorex (Drums), the Chris Corcoran Trio are a truly unique presence on the UK Blues scene. The show is an astonishing instrumental tour de force. Not to be missed! Greg is a hi-octane showman who blows audiences away and gets them dancing! Don't miss this great opportunity to see him back at The Bear Club. Sugarkane evolved from original John O'Leary Band which first hit the road in 2002. In 2009 the name was changed and since then the band has trail blazed an unique and uncompromising brand of blues based music and in the course of its journey, has both thrilled and challenged audiences wherever it has played. The band's musical foundation lies wholeheartedly in the blues but there is also a hefty mix of Jazz, Funk, Latin, Rock and even Reggae to produce a potent individual musical brew. Noted for its jamming approach, today, Sugarkane is an established and popular attraction on the British blues scene. The band consists of founder John O'Leary (harmonoica), long term members Jules Fothergill (guitar), Roger Inniss (bass), Jools Grudgings (keys) and Joachim Greve (drums), reinforced by the recent addition of guitarist & composer Steve Wright. With the Julian Siegel Quartet, Julian has chosen to work with some of this generation’s most distinctive voices to create a group that is becoming one of the most in-demand quartets on the UK Jazz scene.The band features inspirational pianist Liam Noble, his fluid touch and dazzling imagination perfectly complementing Siegel’s music and playing, and providing a perfect foil for the many directions the music can turn. 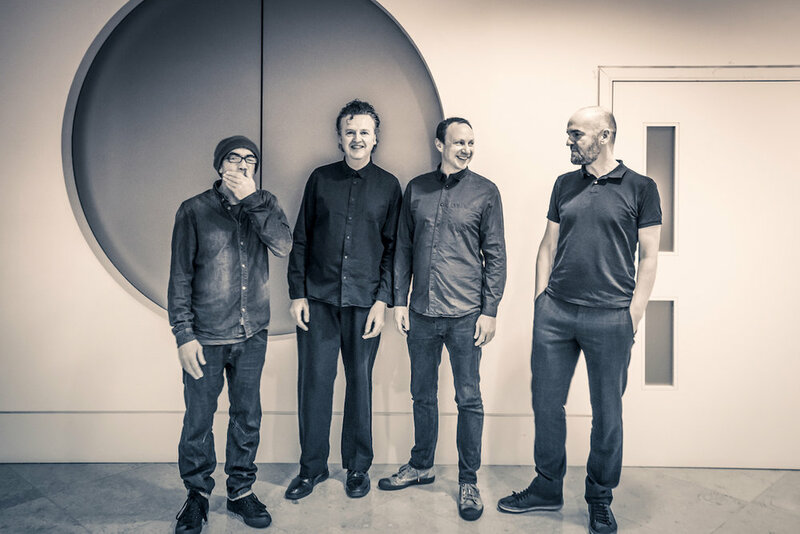 With the creative spark of dynamic drummer Gene Calderazzo and the deep groove of bassist Oli Hayhurst dove-tailing perfectly with Siegel and Noble this is unquestionably one of the UK’s most exciting and powerful quartets. Following up from their London Jazz Award winning album 'Urban Theme Park' (Basho) the band release their third Album 'VISTA' (Whirlwind Recordings) in February 2018. Recorded at Livingston Studios, London it features ten of Julian’s compositions plus an arrangement of Bud Powell's ‘Un Poco Loco’. This new acoustic set of music moves freely through varied sound worlds and colours, from undercurrents of bop to searching ballads and joyful melodies. The grand finale to the music club's season is a performance from the seven strong legend that is She’Koyokh. They have spent fifteen years absorbing the rich folk music traditions of Jewish Eastern Europe, Turkey and the Balkans and their passion for this repertoire is plain to hear in every scintillating note. This will be a fitting climax to our series of twenty thrilling concerts. A special mid-week gig from Don Gallardo, a returning friend of The Bear, who is touring the UK from Nashville, Tennessee. Named an "artist you need to know" by Rolling Stone magazine, Don blends Americana and Country beautifully, and we couldn't help open the doors again to him. Petrie are an alternative-pop band from Hertfordshire, seemingly intent on pushing songwriting boundaries to their limits. Brash guitars and lurching beats are combined with synth melodies. Their track ‘Slurs’ hit no.11 on Spotify’s US Viral chart and was Introducing Track of the Week on BBC Radio 1Xtra. The Scruff started 2018 as ‘ones to watch’, following on from what feels like a break out few months for the Bedford rockers. Their track ‘Her’ was BBC Radio 1 Introducing Track Of The Week, supported by Steve Lamacq on BBC 6Music and featured as This Feeling Radio X Track Of The Week too. 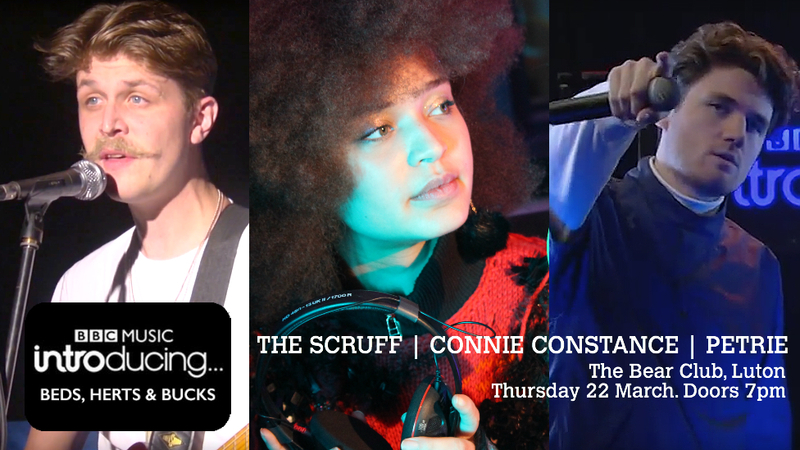 There’s still plenty of big things to come for The Scruff and this could be the last chance to catch them play a special stripped back set in such a intimate venue. With her new EP Boring Connie, Watford’s Connie Constance is setting out to prove that she’s anything but. In the current wave of singer-songwriters emerging from the U.K., the 22-year-old artist stands alone, making indie rock-influenced, off-kilter soul with poetic narratives. It’s a sound that has turned heads from the NME, The FADER and BBC Introducing. £23.50 in advance + booking fee (£19.00 + bf for Bear Club members). This group has been working together since 2014 and this marks their 5th tour, bringing together musicians from Austria, UK, Switzerland and Germany for the first time in the UK. The program features the music of the great bebop pianist and composer Elmo Hope (1923-1967). Much of the programme is arranged for quintet by pianist Claus Raible, with some transcribed Elmo Hope originals included. The challenging compositions of Elmo Hope deliver a hard swinging set fronted by the band’s co leader Herwig Gradischnig and Steve Fyshwick in the horn section. In 2015 the group recorded their debut record “Searching For Hope” while on a tour of Austria and Germany. 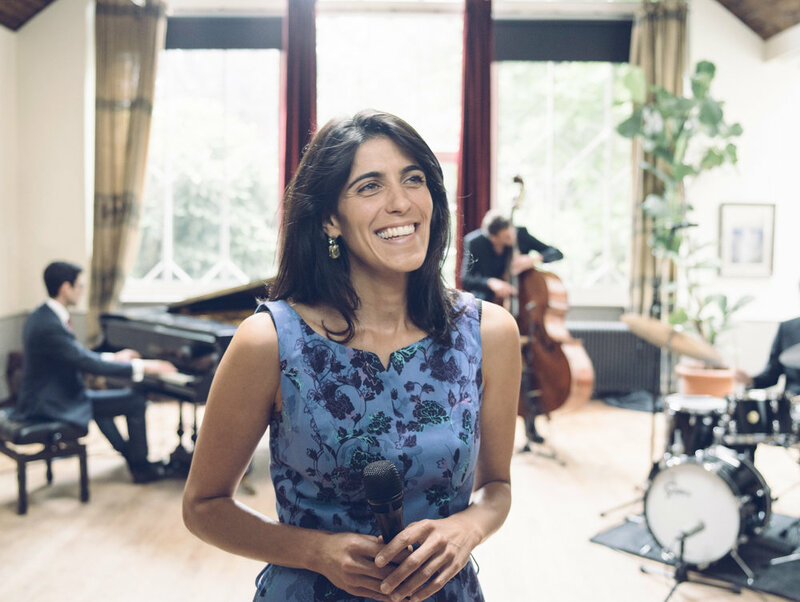 Alto saxophonist Sam Braysher received critical acclaim for his recent debut album 'Golden Earrings', a duo recording with the New York pianist Michael Kanan, and their accompanying UK launch tour. His new trio project sees him presenting thoughtful takes on a diverse repertoire, ranging from Dexter Gordon to Gershwin incidental numbers to Disney. The group's sound is informed by the groovy ensemble concepts and arrangements of Ahmad Jamal, Thelonious Monk and Sonny Rollins. Braysher is joined by an exceptionally swinging London rhythm section: Connor Chaplin on double bass and Josh Morrison on drums.